If you have been injured due to someone’s negligence, call David Azizi, an Escondido personal injury lawyer. David is a compassionate and experienced attorney, practicing in California since 1998. We offer a free consultation and an honest assessment of your case. We can be reached anytime day or night at (800) 991-5292. We know accidents don’t happen only during business hours, and we are here when you need us. When choosing the right personal injury lawyer to represent you, we suggest choosing someone who understands the trauma an accident can cause. David Azizi has 21 years of experience, and as a father of three children, he understands the many ways an accident can affect your life. The firm works with accident reconstructionists, private investigators, police officers and doctors. This ensures that no stone will be left unturned when we investigate your case. In any personal injury case, it is necessary to prove liability, and David works hard to do just that. 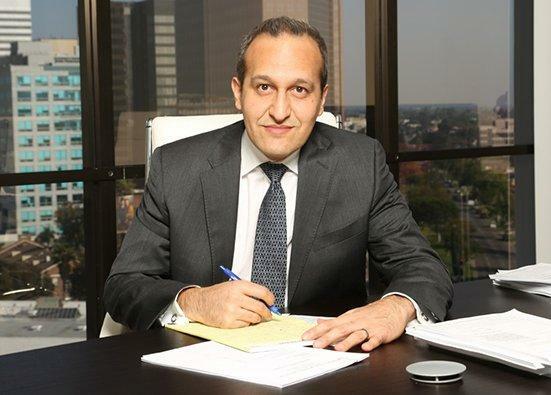 David Azizi has focused his legal career on personal injury law. Since 1998 he has been helping clients receive the maximum compensation for their injuries. Over the course of his career, he has helped clients receive over $55 million for their injures. He was nominated as a Rising Star Super Lawyer in his early legal career, and has recently been elevated to a California Super Lawyer. We urge you to read his reviews by clients and his peers alike on the legal site, Avvo. Expertise.com calls him one of the top lawyers in Los Angeles. If you would like to speak with David directly contact our law offices today. Interstate 15 and US Route 78 run right through Escondido, California. Some of the other highly trafficked roads include East Lincoln Avenue, East Mission Avenue, Bear Village Parkway and North Broadway. With a large number of drivers on the road throughout the day in San Diego County it should come as no surprise that accidents are going to happen. If you have been injured due to the negligence of another driver and are seeking legal representation from an Escondido, California, car accident lawyer contact us today. Slip and fall and trip and fall cases are known as premises liability cases. There are many San Diego and Los Angeles law firms that will pass or look over premises liability cases because they feel as if these types of cases are hard to win. At the Law Offices of David Azizi we are confident we can win your slip and fall case. We are so confident we will work on a contingency basis, meaning we will not charge you for any legal services until we win your case. When looking for a Southern California slip and fall lawyer, contact us today at 800-991-5292. The weather in Southern California, especially the San Diego area, is ideal for spending time outside. Many motorcyclists travel to this part of the state to enjoy their favorite mode of transportation. However, when a biker gets into an accident, major injuries often result because there is nothing to protect the rider. If you are seeking an Escondido, California, motorcycle accident lawyer reach out to us today. Interstate 15 is one of the most highly traveled interstates in all of Southern California. A large number semi-trucks will travel up and down this interstate transporting goods and freight. There are times in which an 18 wheeler gets into a major crash and multiple cars are involved. If this has happened to you, call a big rig accident attorney who has the experience you need at (800) 991-5292. When you are hurt in an accident caused by negligence, turn to David Azizi. Facing the financial difficulties medical care and lost wages can bring makes the situation worse. Call (800) 991-5292 to set up a free case evaluation. David will review your case and answer your questions. You will never be charged a penny until you win.